For the better part of this year, we’ve been journeying through the story of David and before that the psalms which are ancient song lyrics attributed largely to David. In a bit of synchronicity, the group of believers with whom Wendy and I worship on Sunday mornings are starting a series of messages on the life of David next week. It flows out of a five week series in which we’ve been looking at the “chain reaction of praise,” and I’ve been asked to give the lead off message of the series. The connection between the two series is the fact that, no matter the circumstances, David was a man of praise and faith. David the hero, David the warrior, David the outlaw, David the sinner, David the King, David the victim — no matter which part of David’s life you study you find him seeking God, praising God, crying to God, and consulting God. You can almost always find a psalm that corresponds to a particular episode in David’s life. Throughout his long journey David was always translating his daily life experiences into songs, poems, and prayers of faith and praise. 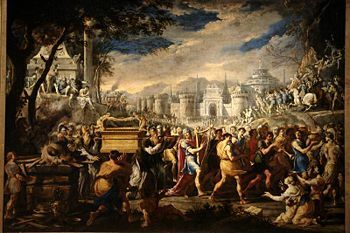 I thought about that as I read this morning of David the King who was not embarrassed nor ashamed to worship and dance “with all his might” before God and the ark of the covenant. He was not concerned with what it might look like to others. He was not worried about looking cool, kingly, and above it all. He was not one to order others to do his praising for him. For David, his relationship with God was not just “a part of the job.” David’s relationship with God was personal from the time he was a boy until he was uttering his last words on his death bed. Today, I’m thinking about my own life and David’s example. I don’t want my faith and praise to be a compartment of my life which I take out on Sunday morning and sundry, appropriate occasions. I don’t want my faith to fit neatly into others sense of propriety. I want my praise to be with “all my might” and my relationship to be intensely personal each and every day of my life. David conferred with each of his officers. There are times when leaders need to lead and don’t need the input of their people. Parenting is a good example. On the other hand, there are times when you develop your credibility as a leader by getting their input. Parenting is a good example. In this chapter, David was getting buy in. He checked with each of his officers before making a decision. It reminds me to be a servant leader and to engage those who I am leading in the process.